I doubt that Rob and I will ever be accused of living too dangerously. We woke at 4 a.m. to the buzzing, chiming, and ringing of FOUR alarms: my palm pilot, the clock radio, Rob's travel alarm clock, and my travel alarm clock. We were already packed and had our clothes for the morning laid out...Lily was safely boarded at the Bird Bed and Breakfast...the doggies were still snuggled up in their warm beds...and by 4:15, we were out the door and on our way to the Bakersfield airport. It was an easy trip to Albuquerque with just a short lay-over in Salt Lake City. Flying into SLC was quite beautiful. The mountains were still covered with snow and the sun reflected off the swampy waterlogged land that edges the Great Salt Lake. At the SLC airport, I picked up a Sudoku puzzle book, and the hour from SLC to Albuquerque flew by. We arrived to beautiful clear blue skies...which happily stayed with us throughout the entire week... and picked up our rental car. (I had to laugh to myself at the silly behavior of the rental car agent. Rob declined the rental company insurance, as he had insurance through his credit card. Of course, the agent tried to "scare" us into taking the extra insurance, insisting that certain items were not covered by the card insurance, but Rob, being an attorney and actually reading the fine print, was quite sure that the items in question WERE covered. When he pointed out the wording in the contract, the agent replied in a very insincere "the customer is always right" kind of way, "Well, you proved me wrong. I'm the stupid one." Rob was perfectly polite and wasn't trying to "prove him wrong." He was just explaining why we didn't need the additional insurance. 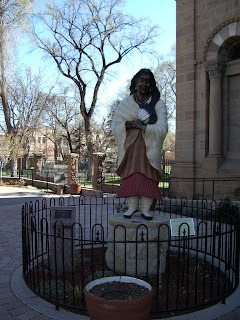 In any case, we quickly got our car and set out immediately for the hour long drive to Santa Fe. 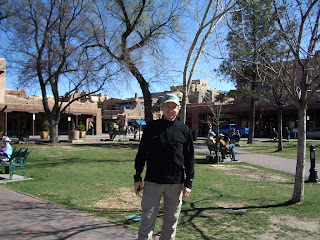 The landscape was not as spectacular as I had hoped...the distinctive buttes and mesas of the southwest are in other locations...and first impressions of Santa Fe were not overwhelmingly positive, either. 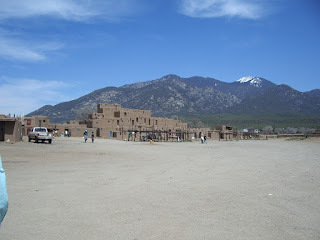 The outskirts of town were just low brown adobe buildings and brown, rather bare looking hills. Happily, our impressions improved as we explored the center of the town. My Mapquest directions took us right to our hotel, the Inn of the Governors. 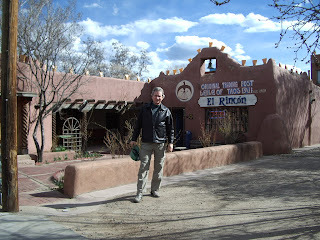 We were greeted by a very nice clerk, Frank, who gave us a recommendation for a good traditional Southwest lunch. 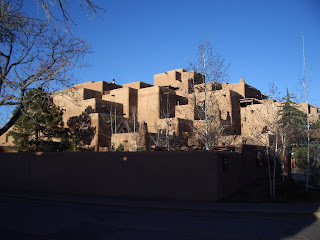 We settled into our room, which had lots of charming Santa Fe touches... bright pillows, wrought iron lamps, baskets, a hammered tin ice bucket, a brightly colored pottery soap dish. 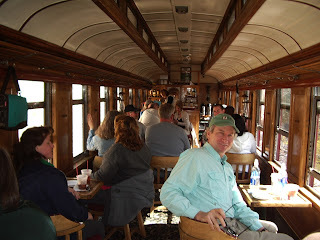 Then we headed to Thomasita's by the old train station for lunch. My mouth had been watering for sopaipillas, the puffy frybread that I remembered from my years living in New Mexico, and it turned out to be a speciality of Thomasita's, included with every meal, along with a jar of honey to drizzle over the top...yummy! Rob had the big combo plate, and I had the "Randy Travis Plate" ("Randy likes it!" proclaimed the menu), with pork chops and hominy. 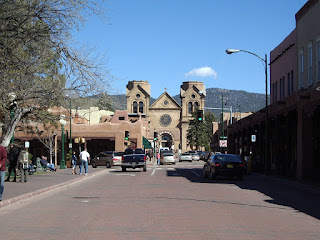 After lunch, we walked to the old Santa Fe Plaza...the big square in town which has stood there since the 1600's! This was much more what I had been hoping for! 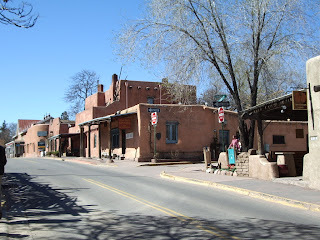 A large plaza lined with old adobe buildings, filled with people sitting out on benches enjoying the lovely day, musicians strumming their guitars...it was a real "people place." Under the awning of the Palace of the Governors, which lines the entire back side of the Plaza, native Americans were selling their crafts...pottery, carvings, and jewelry. Rob bought a little wedding-style pot, and I bought a beautiful turquoise and silver necklace from the woman who had made it. We spent the afternoon just wandering through the shops, getting some good ideas about places to visit the next day. We found a fascinating shop filled with intricately carved doors and wooden screens, many filled with Hindu themes and gods. Apparently, there is a big market here for these ancient wooden doors as they go so well with the adobe pueblo architecture that is so prevalent here. Finally, we returned to our hotel for the complimentary tea and scones and a little rest. That evening, we headed out again and wandered the streets some more, looking for a good place for dinner. 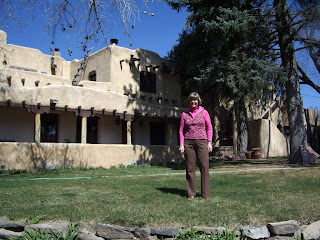 We went into the huge Inn at Loretto, a very impressive huge pueblo style hotel, filled with upscale shops and a very expensive restaurant. We had a nice talk about snorkeling in Tahiti with the maitre d', but decided to keep on hunting for a reasonable dinner. 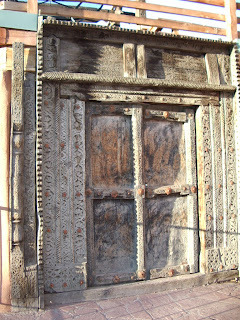 Across the street, we found some more of the intricate door panels. The owner of the shop told us they come from the Punjab region of India. He himself was from Afghanistan and had recently returned there for a visit and had traveled all over the country. We asked about conditions there, and he said that conditions are much improved over what they were in the past. "Used to be 95% problem. Now only 5% problem - just along the border with Pakistan." We got a recommendation from another young man to try the Blue Corn Cafe for dinner...blue corn tacos and Southwest Shepherd's Pie. Then we browsed the shops (LOTS of pottery and art) a bit longer and returned to the hotel for an early bedtime after our long day. I'm not sure why, but neither of us slept very well so we woke up a bit tired and draggy, but felt a bit better after a nice shower and the complimentary full breakfast provided by the hotel. It was a gorgeous day...cool but sunny...just right for walking and exploring. 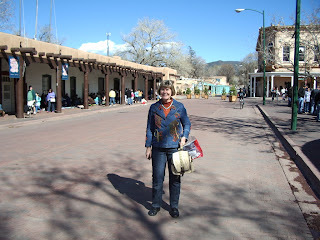 We used the Santa Fe Guide which I had found on a tourist table in the little shopping mall that leads to the town plaza to search out the main sites. 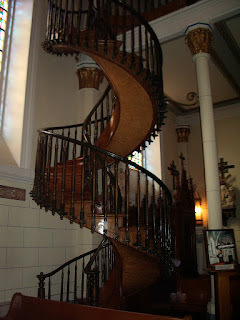 First stop was the Loretto Chapel, which is famed for its "Miraculous Staircase," a spiral stairway that appears to have no support. Even more interesting is the legend of how it was built. The Sisters of Loretto were visited one day by a little old man who offered to do carpentry work for them. They were delighted at the opportunity to have the staircase built. He worked with nothing but a few simple tools, and when the job was done, he disappeared without taking any payment. There is no record of a lumber purchase in the town. The legend says that the old man was Joseph, the carpenter (father of Jesus). Neat story. 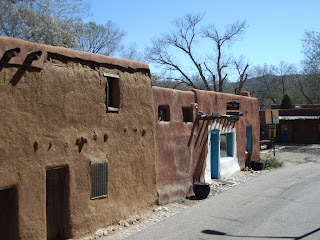 We continued along the old Santa Fe Trail...yes, the actual route of the Santa Fe trail that brought pioneers into the town...and visited the oldest neighborhood, the oldest house, and the oldest church (San Miguel Chapel) in the entire United States. The church was lovely...simple and bare, with primitive paintings done by the native Americans who had worshipped there under the Spanish padres. 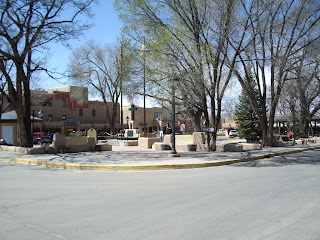 On the other side of the Plaza stood the Federal Courthouse, the only major building downtown with an architectural style out of keeping with the pueblo look of the rest of the town. We also visited the Museum of Art, which had a very odd exhibit of science-inspired art, including a film showing the "evolution" of a fish into a man. The image changed so slowly it was almost imperceptible, but gradually the fins morphed into limbs and the creature moved from a fish through an amphibian, a reptilian, a mammalian creature and finally from an ape into a modern man. It was Palm Sunday, so we didn't want to enter the main cathedral off the town square in case there was a mass going on, but we enjoyed the interesting and unique statues in front...one of the first Native American woman to be made a saint, and the other a very cheerful (and chubby) St. Francis. 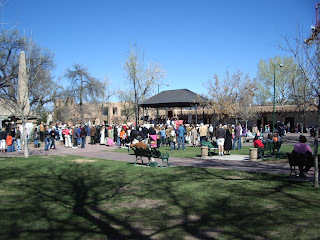 When we returned to the Town Plaza, we discovered that the Plaza was filled with people celebrating a Palm Sunday mass right there in the square. Everyone held a palm frond and following the service, they all paraded around the plaza. We had lunch at the LaFonda Hotel, which used to be one of the famous Harvey House Hotels in the early days of the Santa Fe Railroad. 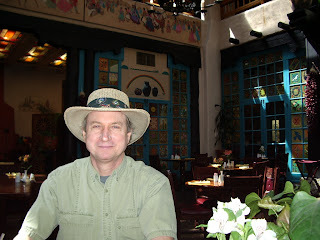 The restaurant was a charming room, filled with painted glass panels, plants, colorful antique cabinets. Lunch was wonderful, too. I had a very tasty and spicy tortilla soup and Rob had trout. 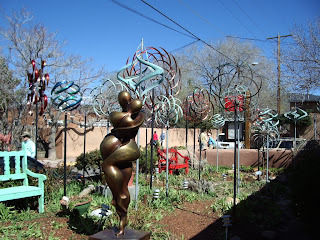 Our good friends, Adam and Patti, had recently moved to Santa Fe from Bakersfield, so after a little after-lunch nap, Patti picked us up (Adam was out of town) and drove us up to Canyon Drive, a street above the city filled with art galleries and cute shops. We wandered in and out of stores and galleries that caught our eye. Patti's favorite gallery was very impressive...with some really gorgeous art pieces and fabulous kalaidoscopes whose lenses created the illusion of looking at a sphere, rather than a flat surface. We also found the gallery of the artist who created the "windmills" that we had been enjoying at our hotel. They are gorgeous, with copper patinas or rich metallic colors. I went in to inquire about the price, and had to laugh when I asked the saleswoman how easy it would be to take it home in a plane. She asked, "Do you have your own plane?" She was very matter-of-fact, as if this was a most customary thing. 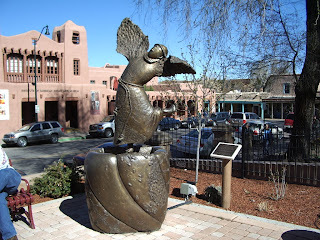 I'm sure that many of the people who buy art in Santa Fe probably DO have their own planes! 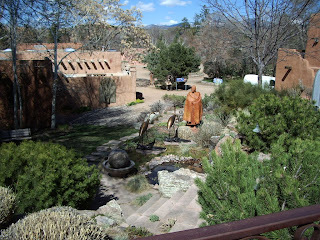 We finished our "tour" with a cup of tea and strawberry shortcake at the Tea Shop, then went up into the hills above Santa Fe to visit Adam and Patti's beautiful home. Finally, we returned to the Blue Corn Cafe, but I was so tired that I really had no appetite, and was happy with a bowl of roasted corn chowder. Rob had a very interesting spinach salad filled with special goodies like jicama and red chili pecans. Then it was off to early bedtime. 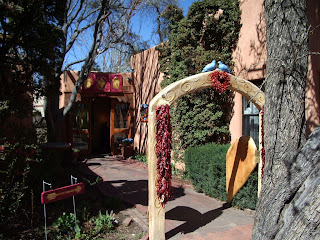 We were surprised to discover that Santa Fe sits at about 7,000 feet elevation! I think that contributed a bit to our fatigue...we were feeling the altitude a bit. 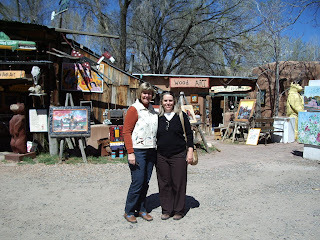 We enjoyed another good breakfast at the Inn of the Governors and by 9 a.m., we were on the "High Road" to Taos, taking the scenic route over the Sangre de Cristo Mountains and through several hidden little villages. Our trip got off to a bit of a shaky start as the freeway out of Santa Fe was completely unmarked for several miles. I was just beginning to think we would have to turn around and start again, when FINALLY we saw the freeway numbers that let us know we were on the right road, so I settled back to relax and enjoy the trip. 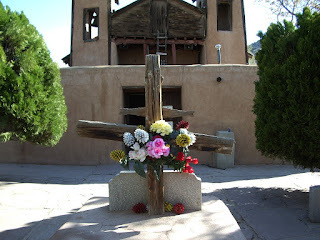 The first stop was in the town of Chimayo, where we visited the Santurio de Chimayo, called the Lourdes of New Mexico, as the little chapel there is the site of an annual Easter pilgrimage. The faithful walk all the way from Santa Fe (about 24 miles) to worship in the little church. It is believed that the dirt outside the chapel has special healing powers, but how this belief started, I don't know. 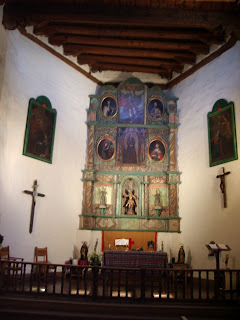 The church was very pretty, though, and like the old San Miguel Chapel in Santa Fe, filled with bright Indian and Spanish artwork. There were several worshipers kneeling inside in prayer. The gift shop outside the church was filled with religious articles...rosaries, crosses, icons, etc. We had a nice chat with one of the sales ladies. She was a local teacher who works in the gift shop during her breaks. She mentioned that she loves San Francisco, so we told her all about the parrots of Telegraph Hill. 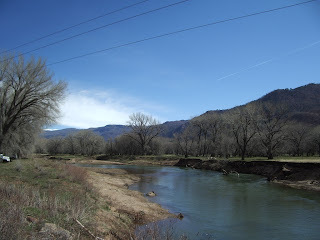 We continued on through the other little towns on our route, including the town of Truchas, where Robert Redford filmed "The Milagro Beanfield War." 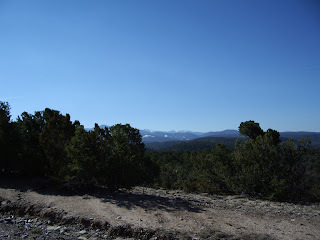 The roads were not well marked, but I kept a sharp lookout for any arrows pointing in the direction of Taos. There was almost no traffic, so it was a very pleasant drive. Once again, good ol' Mapquest directed us right to our Bed and Breakfast, the Inn at LaLoma Plaza. The Inn is a lovely old adoble style stucture sitting up on a little hill a few blocks down the street from the Taos Plaza. It was named one of the top 10 romantic B&Bs in the United States by USA Today, and it was a charming place. 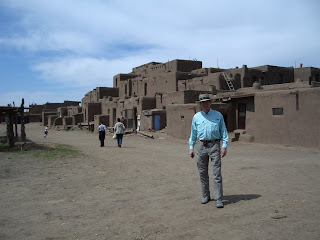 After lunch, our room was still not ready, so we headed out to Taos Pueblo just a couple of miles north of the town at the base of the snow-capped Sangre de Cristo Mountains. Visitors must register at the Visitor's Center - and pay a $5.00 fee to take photographs. 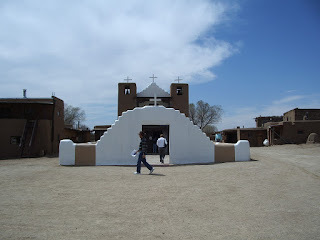 We walked into the large square that stands between the two major pueblos. At the front of the plaza sits the pretty brown and white church, and the smaller one story dwellings where most of the villagers actually live. 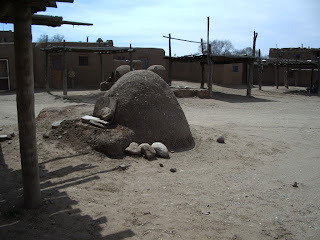 I was amazed to discover that the large pueblos have been inhabited for 1,000 to 1,500 years! Today, they are used at ceremonial times and contain little shops where the Indians sell their crafts, but they still do not contain electricity or other conveniences, so most of the people live in the newer buildings scattered around the square. 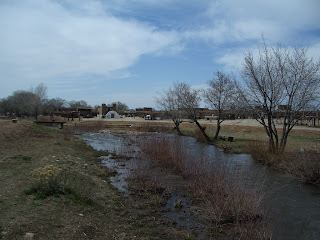 My memories of my previous visit to Taos Pueblo in 5th or 6th grade were quite fuzzy...I had forgotten that there are two large buildings at either side of the square and separated by a little river that runs right down the center. We bought an apricot bar from a woman who was cooking bread and pastries in one of the many dome-shaped ovens that sit outside of the pueblos. Then we wandered into one of the several shops that line the square. 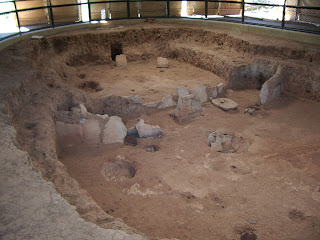 The inside of the pueblo was very simple, with whitewashed walls and dirt floor. We went through the entry room into a back room where a man had his carvings of bison, jewelry, and other crafts on display. I bought a pretty dreamcatcher, with a leather turtle and macaw feather hanging in the center. On the other side of the square, some of the shops were much more commercial enterprises - real gift shops with T-shirts, more beautiful pottery and jewelry. Rob got a nice T-shirt adorned with colorful horses. On the way out, we stopped into the church where the statues of the saints were all shrouded in purple cloth in anticipation of Easter the next Sunday. 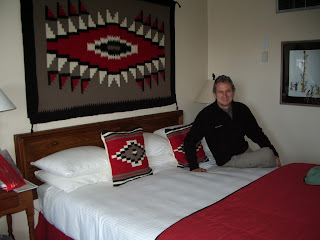 Then it was time to return to the Inn at LaLoma Plaza where our "Happy Trails" room was finally ready for us. What a great room! We were on the second floor with good views of the mountains. 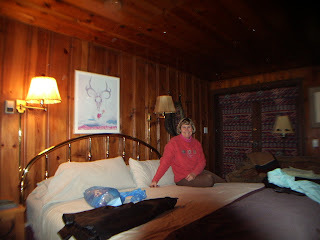 The room was paneled in knotty pine, had a big brass bed, a comfy couch, a library of books, and a fireplace all prepared for us. 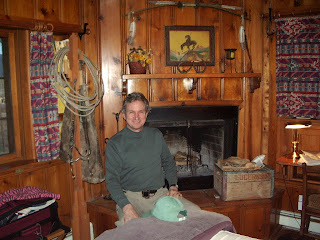 The western theme dominated the room - a coat rack with lasso and leather chaps stood at the foot of the bed. We settled in and then headed back to town to browse around. We had a funny encounter with the shopkeeter in a shop filled with brightly colored Mexican style pottery - ceramic pots in the shape of frogs, large suns to hang on the fence. We liked the pottery, but it was too big to consider bringing home on this trip...but the man was just determined to do a sale. "Everything in the shop is 50% off! If you buy two things, I'll give you big discount! If you buy lots, we can make a group deal! I can arrange shipping!" We enjoyed his enthusiasm...and Rob had me laughing for the next couple of days with his imitation of the man's spiel. 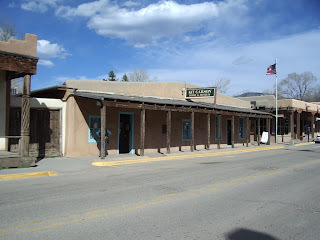 Next door to the Pottery Shop (and across the street from Kit Carson's old house) was the El Rincon Trading Post. We spent quite a bit of time visiting with the owner, a nice young fellow who gave up his musical career to take over the family business, which had been started by his grandmother. 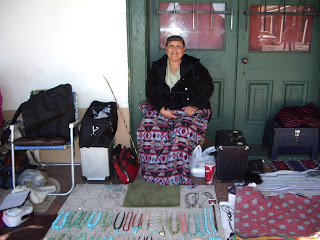 The front of the shop was crowded with Native American arts and crafts, but the back room was a "museum" which looked like a family's personal collection of interesting artifacts. There was a wall filled with pictures of the family, including the aforementioned grandmother, who had been a beautiful young woman - and a former Miss Taos, if I remember correctly. 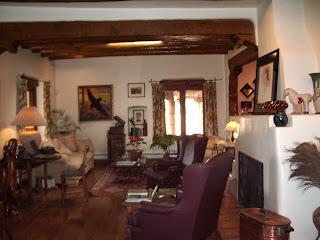 Back in the 1930's, she had purchased most of the furniture and artifacts from the Kit Carson heirs and then loaned most of it back to the Kit Carson House when it was furnished as a tourist site. A pair of his leather pants still remain in the museum, along with assorted bison skulls, a "tufa mold" that demonstrated how the silver jewelry and belt buckles are made, and various other items strewn helter skelter around the room, on the walls, and in dusty display cases. We bought a little Kachina doll for our cabinet, there. It was a memorable stop! 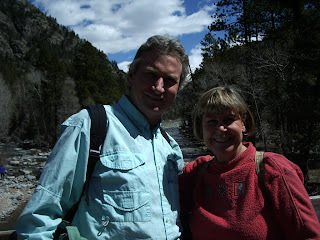 We finally got a cell phone call from Adam and Patti, who were in Taos for the day to look for a dining room table. We met them at a little coffee shop on the corner of the town plaza (where I had a bittersweet mocha with grated orange - yum!). After coffee, we all went to an antique store on the plaza run by a very charming elderly man from Lyon, France. We enjoyed talking with him, and he seemed to enjoy it as well, saying, "Goodbye, nice people!" as we departed. We ended our day in Taos with a very nice dinner at The Apple Tree, a cute little restaurant with local art for sale on display on the walls. Dinner was another winner - trout for me, and a beef tip pasta with kalamata olives and sun-dried tomatoes for Rob...and coffee ice cream with Mexican chocolate chips for dessert. More yum! 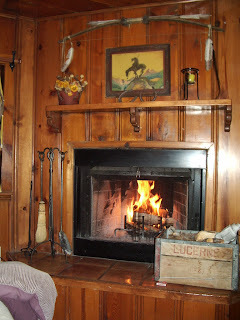 Then we returned to our Inn where we built a roaring fire, read, talked, worked Sudoku puzzles, and snuggled down for a good night's sleep. 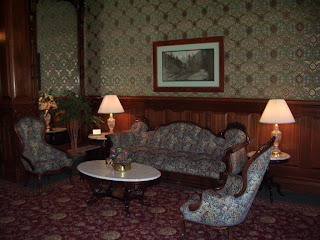 It was very quiet there, even after we opened the window because our room got so hot from the great fireplace! We started the day with a wonderful breakfast in the large sunroom of the Inn. Besides the usual cereal, tea, juice, and fruit, we enjoyed a made-to-order strawberry-banana smoothy and a wonderful granola pancake. By 9:30 a.m., we were packed and on the road to Durango. We had a funny adventure trying to fill our rental car. We could not find a latch to open the gas tank anywhere and spent about 15 minutes pushing and pulling every button and lever we could find. We finally discovered that we just had to push on the little door and then insert a fingernail and pop it open. THEN we discovered that the pump we had selected was defective and pumped gas at the rate of about one drop per minute! Happily, it was another beautiful day and we were not in a hurry, so we just laughed it off. 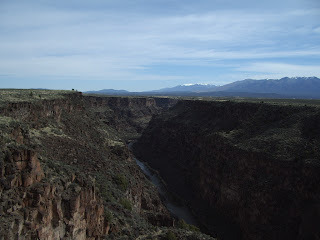 A few minutes out of town, we crossed the bridge over the Rio Grande gorge. The land around the canyon is so flat that you don't realize it is even there until you are right on top of it! 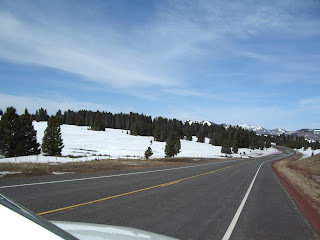 The first part of our drive was through rather monotonous scenery...flat scrubby plains, although the snow-capped mountains in the distance were very beautiful. But suddenly, we came across a weird and fascinating little community. Buried partway into the earth were little houses trimmed with solar panels. Some of the houses looked like something out of a Dr. Seuss book with spires and towers and fantasical little shapes. 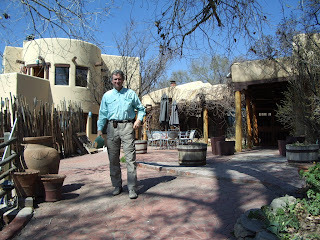 The sign outside the gate to the community said "Earthship" so I looked it up online. 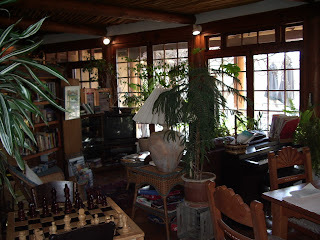 As I suspected, it is a community of houses built to be earth-friendly, built with recycled materials, using solar power, etc. You can learn more at their website. 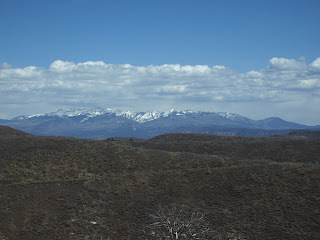 At Tres Piedras, we suddenly began climbing into the Rockies and the scenery became much more beautiful. After driving through pine covered hills, we got up into the snow fields. Rob opened the car windows for the "fresh air," and I was soon scrambling for my coat in the back seat. We climbed very high over the ridges then dropped down to Tierra Amarilla where we stopped at a dumpy little roadside cafe. But you can't judge places by their looks! We had another good visit with the clerk who enjoyed talking to Rob about his visit to New Jersey and Rutgers. (We have had lots of pleasant "people encounters" on this trip!) 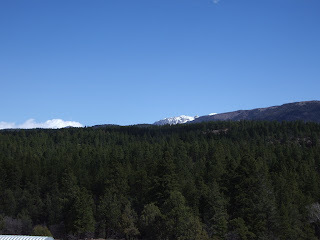 We continued on through gorgeous Rocky Mountain views. I kept trying to take pictures out the car window - not an easy feat! We stopped in the beautiful resort town of Pagosa Springs, Colorado and had lunch at Victoria's Reign Cafe...another serendipitous stop! It was one of the best meals of our trip, with a creamy asparagus soup and the best quiche we have ever eaten...made with real cream...and a caesar salad. The waiter told us about the famous hot springs in the town. This is definitely a place we would like to visit again! Just an hour past Pagosa Springs, we rolled into Durango. First impressions of the town (since a visit here about 15 years ago) were surprising. I had remembered it as quite a bit more green and wooded. It sits at the base of some high brown hills and most of the trees had not yet grown their spring foliage. The road coming into town was the usual mix of Best Western hotels, auto shops, strip malls. 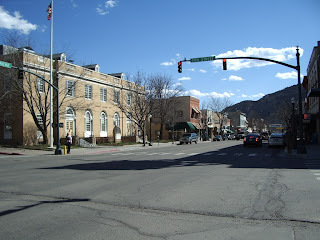 But Main Street was charming, with the old 1800s buildings restored and spruced up into a cute little western town. 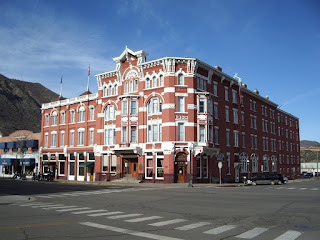 We stayed at the historic Strater Hotel, which has been lovingly restored to 1890's splendor, furnished with antiques, gorgeous wallpaper, Tiffany chandeliers. I learned that Louis Lamour used to stay here. 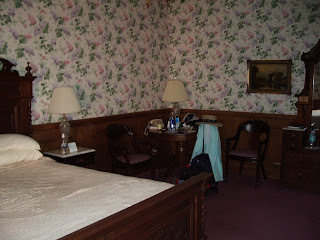 We were greeted by a pleasant clerk in the Victorian lobby and immediately checked into our room which was wonderful...comfortable and spacious, with a great king bed, antique dresser (with sticky drawers), table and chairs. A small box of Rocky Mountain Chocolate Factory chocolates was on our bed. I completely unpacked my bags for the first time on this trip (I hate living out of a suitcase!) Rob showered and took a nap while I went out to do some investigating about hikes and walking tours of the town. 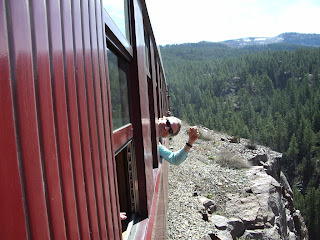 I discovered happily that the Durango and Rocky Mountain Train to Silverton had a winter schedule - hurray! It does not go all the way to Silverton until the middle of May, but even the trip halfway there is supposed to be spectacular. Rob and I hurried down to purchase tickets for Thursday. 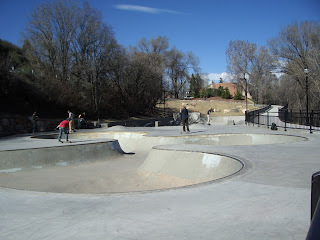 We then walked along the bike path along the Animas River, where we discovered a very good skateboarding park where the town boys amazed me with their derring-do...leaping into the cement pits and bounding out again on their skateboards and bicycles. On the way back to the hotel, we passed by Nature's Oasis, a nice big health food store. I had to laugh, because the minute I pointed it out to Rob, he...as I was sure he would...was drawn to it like iron to a magnet. We ended up having another very good dinner there. The store had a wonderful deli with an assortment of various salads, curried turkey, tuna salad. We had the "pound plate"...a pound of food made up of any combination of dishes that we liked. We finished the day seeing the movie, Amazing Grace, at the local moviehouse down the street from our hotel. We slept soundly in our very comfortable bed, and woke to another beautiful day with clear blue skies. We went downstairs for the hotel's continental breakfast, which was substantial, although not as noteworthy as at our Santa Fe or Taos hotels. Unfortunately, we had chosen to sit in a booth next to a lawyer who talked (loudly) on his cell phone the entire time we were eating. 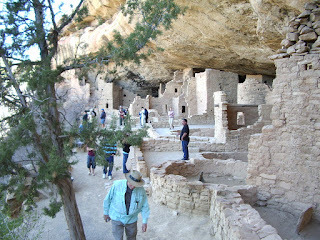 After breakfast, we set off over the hills to Mesa Verde. I'm still amazed by how much I don't remember. Nothing really looked familiar to me until we actually arrived at the cliff dwellings. 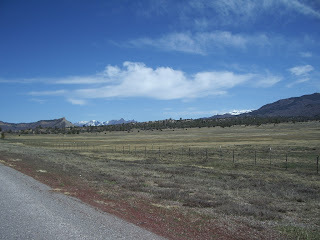 We stopped in Mancos, the little town at the base of the mesa, to buy a picnic lunch with very fresh pre-made sandwiches. It was a gorgeous drive from the part entrance back to the sites that were open at the back of the park. 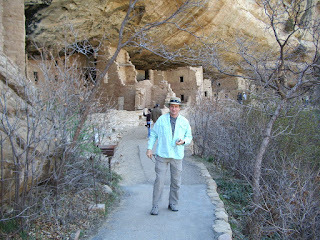 We were a few weeks too early to visit all of the cliff dwellings. Most of them do not open until May 5. 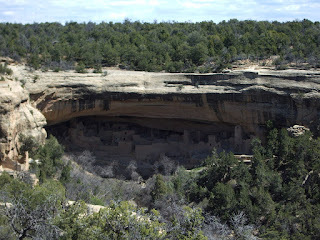 But we did take the steep path down to the Spruce Tree site, which is the best preserved of the cliff dwellings. It is amazing to think that people lived in these very remote and hard to reach places. I learned that the people actually climbed up and down into the cliff dwellings using hand and foot holds chipped into the sides of the cliffs! I can't imagine being a mother there, worrying every minute about my toddler falling off the side of the cliff! 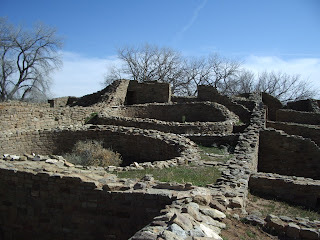 We ate our picnic lunch and took the drive along the Mesa Rim loop, looking at excavations of the pit houses, houses built down into the ground, which were the earlier dwellings of the Anasazi of this region. 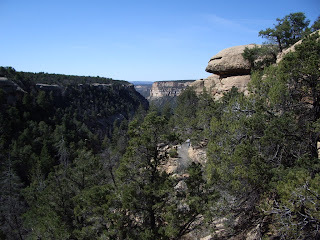 We stopped at the Sun Temple, a large red structure, and looked across the great canyons at the large cliff dwellings on the other side. 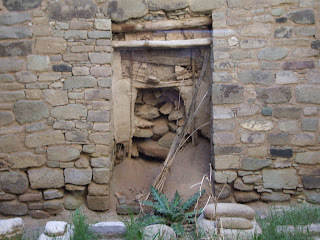 I was surprised by the number of dwellings...they seemed to fill any crevice large enough to hold them. The weather continued to be perfect...warm and sunny, although we could see rain storms over the Rockies to the north. The air was so perfectly clear that we could see all the way to Shiprock, the beautiful basalt cone that rises abruptly out of the New Mexico plains to the south. I have very fond memories of Shiprock, as we could see the sun setting behind it from our kitchen window in Farmington, NM when I lived there back in 1959. 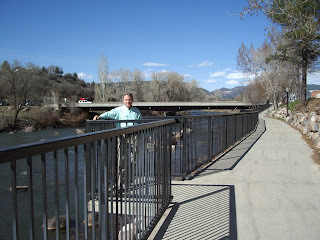 We returned to Durango in the afternoon and took a walk around town, stopping in at the local Internet Cafe to check our email, then returned to Nature's Oasis for another good pound-plate. Later that evening, we enjoyed the hotel's jacuzzi. What a fun experience! Hotel guests must make reservations and get the jacuzzi room all to themselves for a half-hour. The only disappointment was that the hotel had been doing some pool maintenance that day and the water had not had the chance to get up to maximum temperature, so it got a bit chilly by the end of our soak, but it was still a fun experience. We woke to another beautiful day. 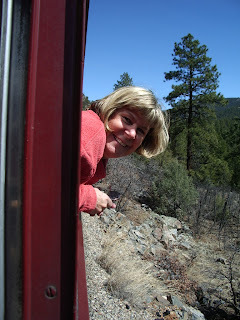 I was especially happy because we had heard an earlier prediction of rain for today...and this was the day we were taking the Durango to Silverton train trip. We had the hotel breakfast, then stopped by Nature's Oasis to pick up a picnic lunch on our way to the train. 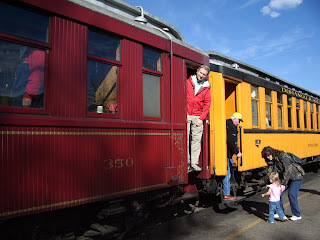 We had splurged on the first class parlor car, and it was a real treat! We had our own "guide/waitress", J. Leigh, who treated us royally, telling stories about the railroad, serving drinks and snacks and encouraging us all to visit and get to know one another. The best treat was that we could stand out on the back platform to watch the gorgeous scenery. 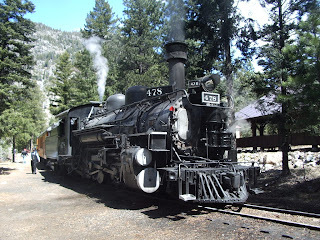 Before too long, all the passengers in the parlor car were chatting away like old friends. We pulled slowly out of Durango past the new residential areas that extend for quite a way out of town. 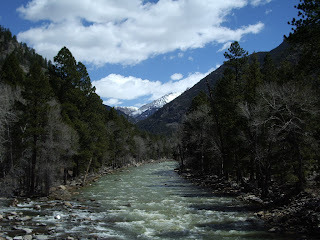 We followed the Animas River through the low ranchlands on the outskirts of town, then began to climb into the Rockies. 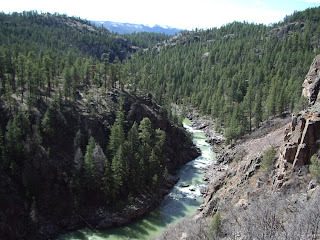 We continued to follow the river, which now flowed through a canyon that got deeper and deeper as we climbed. 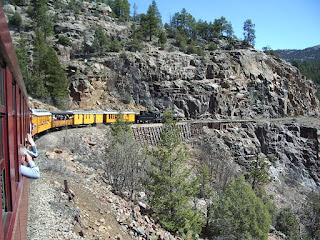 Before too long, we were riding the rails right along the edge of a deep gorge...breathtaking, and a bit scary. We had fun sticking our heads out the windows to enjoy the views up ahead. "Rocky Mountain High." It suited my mood perfectly. Rob was also especially excited about the trip. He said that he had expected a fun day chugging through the pines, but he had not anticipated the dramatic views of the trip. 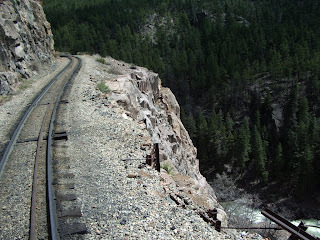 We finally reached our destination of Cascade Canyon where the train turns around (through the use of a "wey" track, which is laid out in kind of a curvy triangle. The train goes past the triangle, then backs up onto the other track all the way past the triangle, and is then ready to go forward onto its original track...but aiming in the other direction. Very ingenious!) 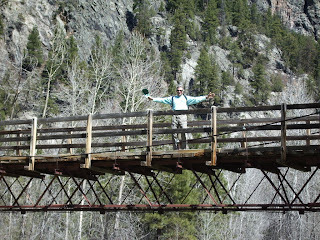 We all got off of the train, and Rob and I found a nice shady picnic table where we ate our sandwiches, then went for a little walk into the woods and over the footbridge that spans the river. After about 45 minutes, we returned to the train where we found little gift bags waiting for us in the parlor car...bottles of water, Railroad logo drinking glasses, and a replica of an 1880's brochure for the train. Our trip back was especially memorable because one of the young men on our car had proposed to his girlfriend while standing on the footbridge. Apparently, he had had the exact place picked out for quite some time, but it was a complete surprise to her. All of the passengers joined in the celebration, with drinks and congratulations. The final treat, as we rolled back into Durango, was a Rocky Mountain Chocolate Factory chocolate bar. A great day! We returned to the hotel for a short nap (the altitude was still affecting us a bit), then we just wandered around town to investigate possibilities for dinner. We finally decided that the Mohagony Grill right in our hotel looked like the best choice...and it was VERY good. I had the "Duck Duck Duck," a lovely presentation of three different duck dishes, and Rob had the chicken special. 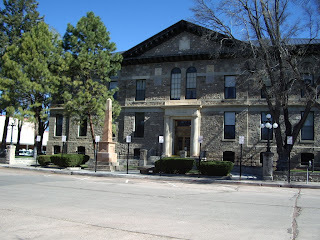 We talked quite a bit about the possibility of actually living in Durango. As we get closer to retirement, we are considering various possibilities, and this is definitely a place to consider! There are so many activities here that we enjoy...hiking, biking, a great college with adult extension classes. We were sorry not to have at least one more day to explore more of this beautiful area. Our last day. We had packed up the night before, so we had breakfast and were on our way by 9:00. 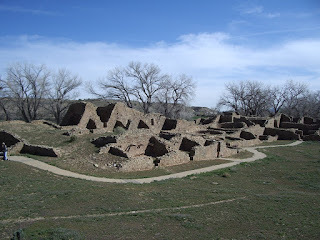 We headed south on highway 550, making one sightseeing stop along the way...Aztec Ruins, which is another old Anasazi settlement lying just over the border in New Mexico. We took the interesting self-guided tour around the old ruins. 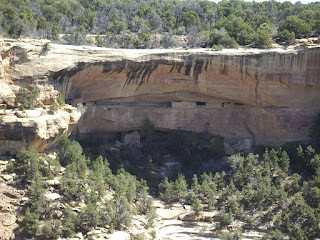 Due to the number of round kivas, it is believed that this structure may have been used as an administrative or ceremonial center, rather than as a daily dwelling place. In one room, you could actually see the remains of the woven straw mat that had been used as a door covering - still embedded in the mud that had filled the ruins prior to excavation...after all these centures! Apparently, there are a number of other unexcavated sites scattered here and there around the region. We could actually see the mound of dirt covering one of them just a bit across the field. 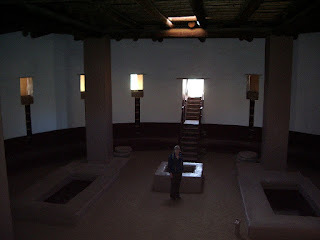 We ended the tour by going into the large restored kiva, the ceremonial pits that mark all of the Anasazi sites. Most of the rest of the day was just spent driving across the ever-changing New Mexico landscape. 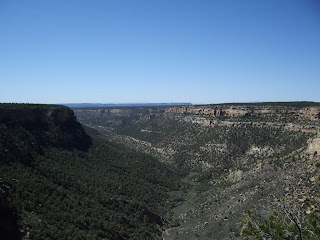 Just when I started thinking the drive would be a very monotonous one, with miles of scrubby flat plains cut through with arroyos and little streams, we suddenly came across a new vista of dramatic buttes and mesas. We left the plains to cross some beautiful pine-covered hills, then descended into a valley of red sandstone cliffs eroded into baroque pillars and columns. A beautiful drive! At lunch time, we started realizing that there were no towns to speak of along most of the highway, so we had our sights set on an Indian casino we had seen advertised on the billboards. We had to laugh when we saw it. 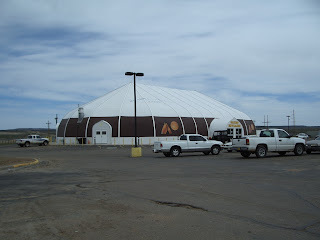 Unlike the large and modern casino we had seen outside of Albuquerque on the first day of our trip, this was a large "circus tent" standing alone in the middle of the desert. 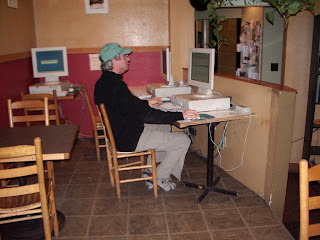 We went in to the coffee shop and had a greasy hamburger and fries, then lost about $2.00 of quarters in the slot machines, (we are big-time gamblers!) and headed off for the last couple of hours of our trip. We arrived in Albuquerque about three hours before our flight so we just relaxed. browsed around the shops of the airport, and worked a few more Sudoku puzzles. (I'm getting pretty good!) Our flight from Albuquerque to Salt Lake City was just a little delayed, so we had a very quick transfer, and were soon on our way to Bakersfield. Our car was safely waiting in the Meadows Field parking lot, and by 10:30, we were greeted by two ecstatic little puppies. A nice ending to another wonderful trip!